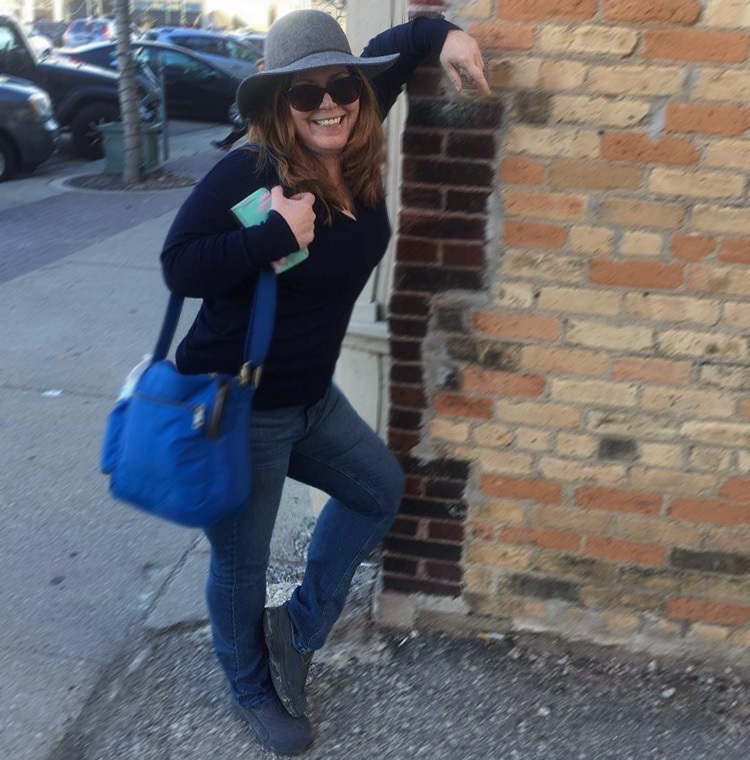 It was time for me to check out some more of Chicago and I planned a great two day jaunt through some restaurants, a distillery, a grand opening, and one of my favorite hotels. Lisa and I made the two hour drive to downtown Chicago and our first stop, BLT American Brasserie. I was instantly impressed with the combination of modern elegance in a very welcoming atmosphere. We got comfortable with some Infamous Goose Sauvignon Blanc and tried to narrow down the menu choices. The restaurant is the first Chicago brainchild of Executive Chef Laurent Tourondel. 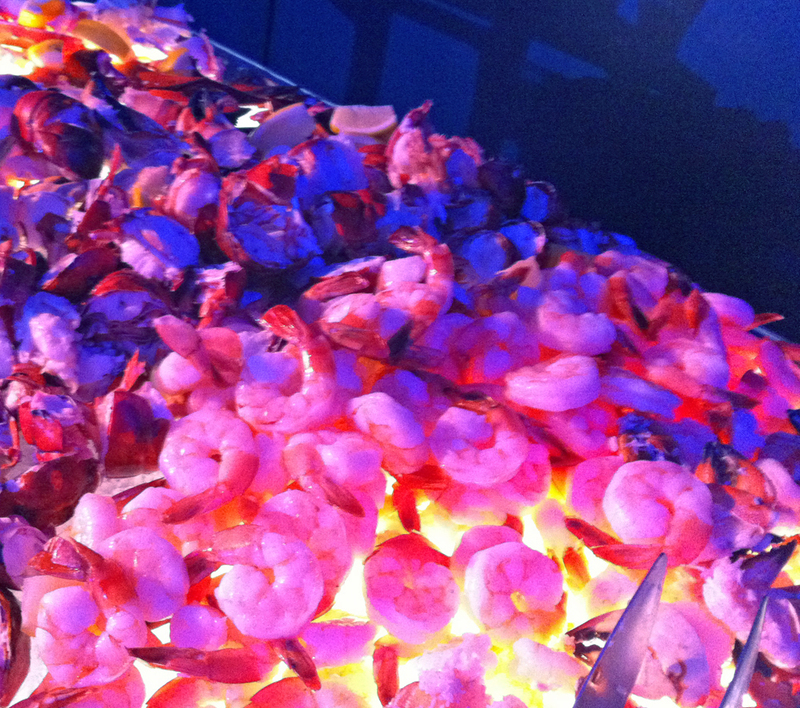 The menu is creative, offering interesting touches without going to the wild side. 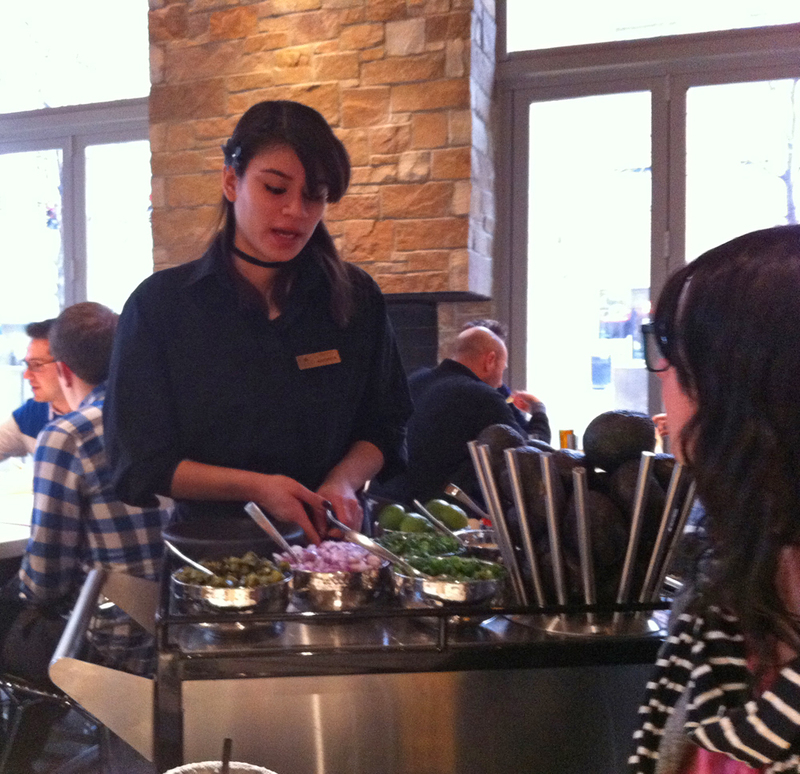 It seemed as if we sampled it all, starting with the flavorful Spinach & Mushroom Dip. As good as it was, it couldn’t possibly top what came next. Chef de cuisine Aksel Thielkuhl worked a week to perfect the Apple Soup and it was well worth it. It came with a “snow” shred of foie gras and shavings of roasted chestnut. We also tasted one of their wonderful Pizzetas, worth a trip on their own. 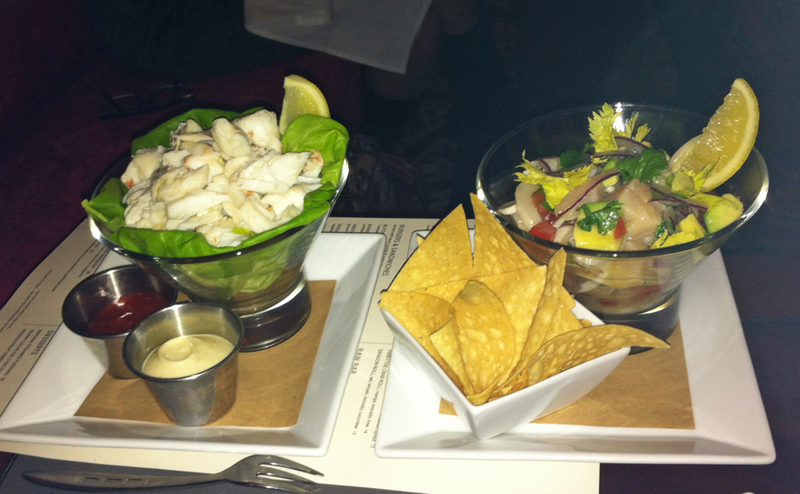 Lisa was my seafood taster and she said the Ceviche was the best she ever had, with large chunks of seafood and a nice cilantro sauce. She also raved about the Lump Crabmeat, fresh and served with both Dijionaise and cocktail sauce. She had a tender and tasty cod fish as her entrée. 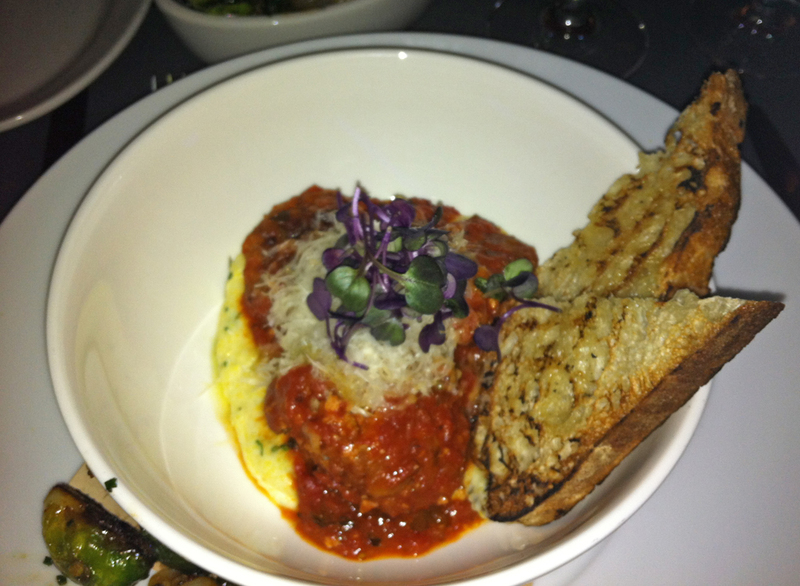 For a main course I had the Veal & Pork Ricotta Meatballs. They were cheesy and not to heavy, served with a perfectly prepared polenta. We had a side of the Braised Brussels Sprouts, with a bit of pancetta for extra taste. Of course, we found room for dessert, but first it was coffee, which is always served with dark chocolate and caramel popcorn (yum!). Then we managed to take a few bites of the Passion Fruit Crepes and Banana Pudding before getting our stuffed selves to the car. I have been to quite a few hotels in Chicago (and still have many more to go), but one of my absolute favorites remains the Palmer House Hilton. There doesn’t seem to be anything that comes close to the history of this magnificent hotel and they always welcome me, this time with a corner suite that was just a bit bigger than my apartment! 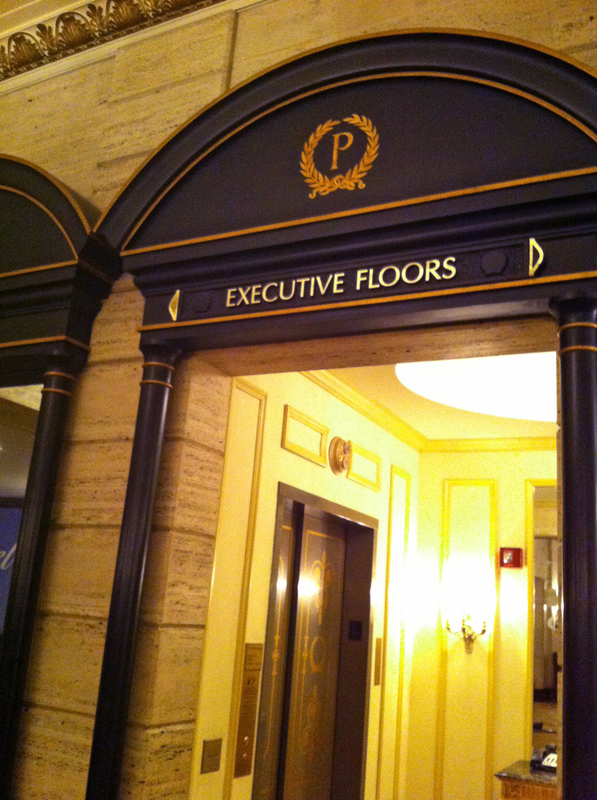 It also came with excess to their very large and well-appointed executive lounge. After a good night’s sleep, I met for breakfast with the always gracious and entertaining Ken Price, who I can listen to for hours. 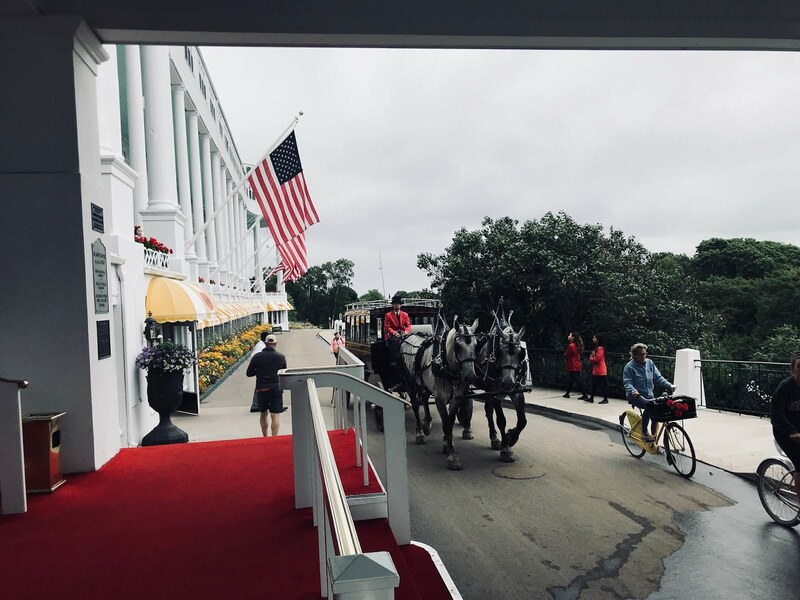 He is now giving historical tours at the Palmer House that are both whimsical and educational (often including a stop for some wine). I strongly recommend you do one next time you are in Chicago. 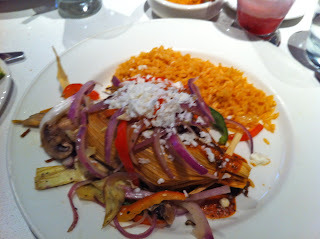 Our first stop of the day was at Cantina Laredo, a cozy Mexican restaurant with a contemporary flare. I loved their cocktail menu with tequila flights, but since we still had a distillery to visit so I decided to take it easy with a delicious Pomegranate Margarita. With it we had incredible homemade guacamole, before an equally delicious Tamale de Barbacoa, a homemade tamale filled with slow-roasted brisket, artichokes, spinach, red pepper and cheese. Lisa also liked the Enchilada Veracruz, which was surprisingly light. 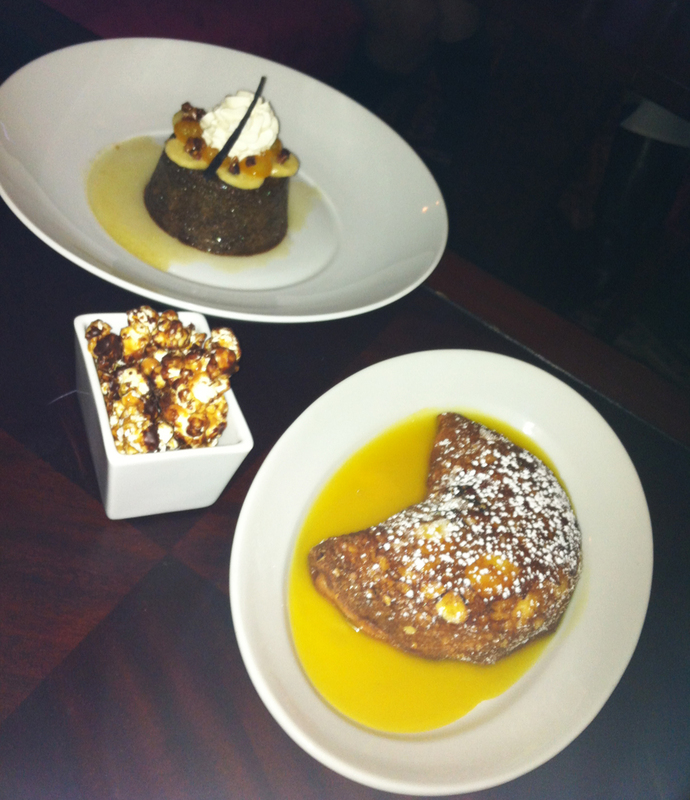 We shared two desserts – a Mango Cake and a Brownie in Brandy Sauce, with Butterscotch which was heavenly. 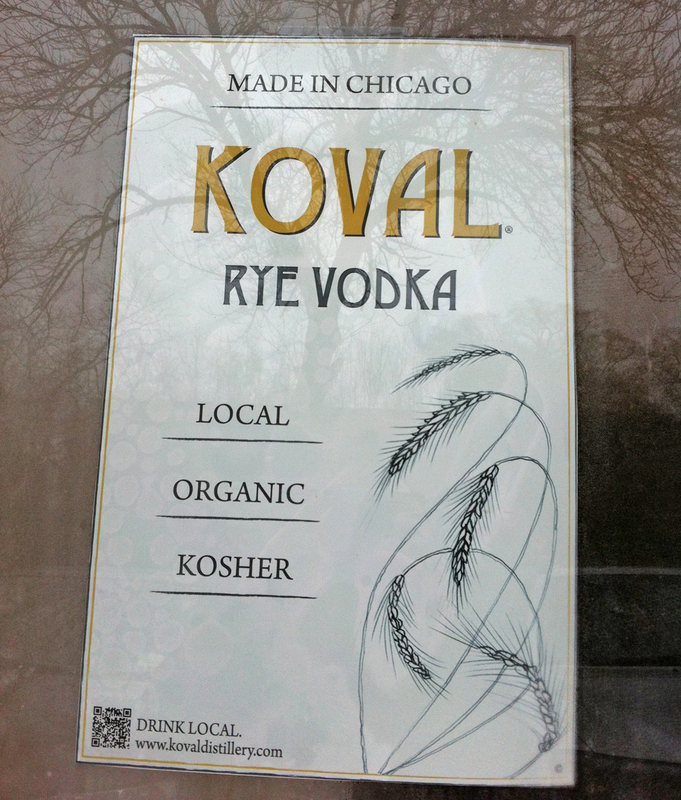 Then it was off to Koval Distillery, located right in the city of Chicago. 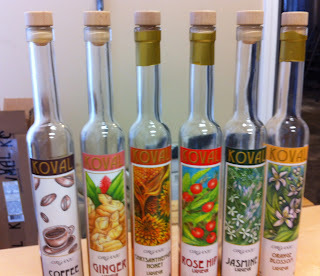 I had tasted some of the Koval liqueurs previously, but they have certainly increased their product line. 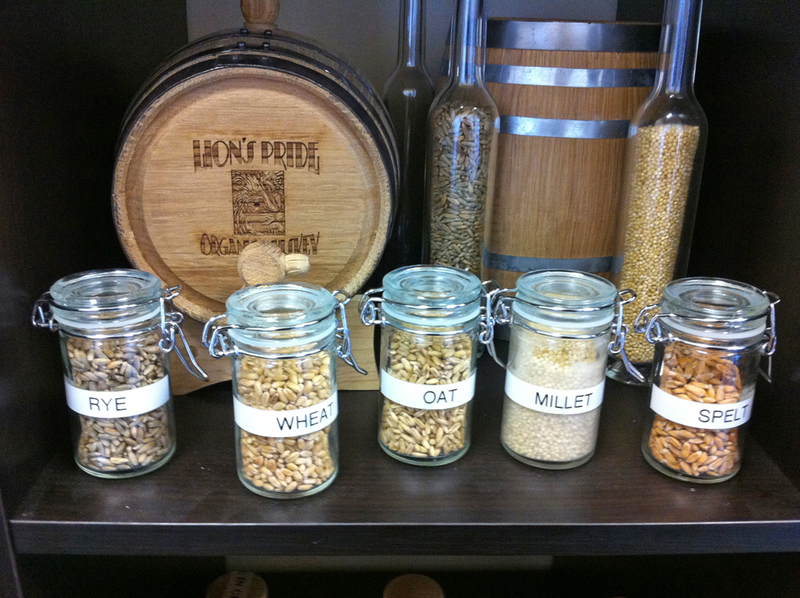 There is now 10 different whiskeys with different mash profiles (they use rye, wheat, oat, millet and spelt). 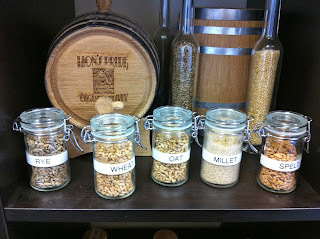 Meghan took us through the five single grain whiskeys, as well as their aged counterparts under the Lion’s Pride Label. 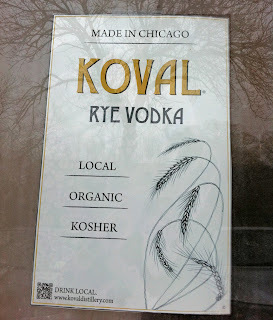 I was surprised to find that it was the spelt I liked best. It has the characteristics of corn in whiskey, with a bit of sweetness, though I was told the Dark Rye and Dark Oat are the best sellers. Do not miss the liqueurs here. They are all great plain or mixed in cocktails. The Ginger and Jasmine were my favorites, while Lisa favored the Orange Blossom. The brand new Walnut was quite good too, though I tasted more anise that nut. 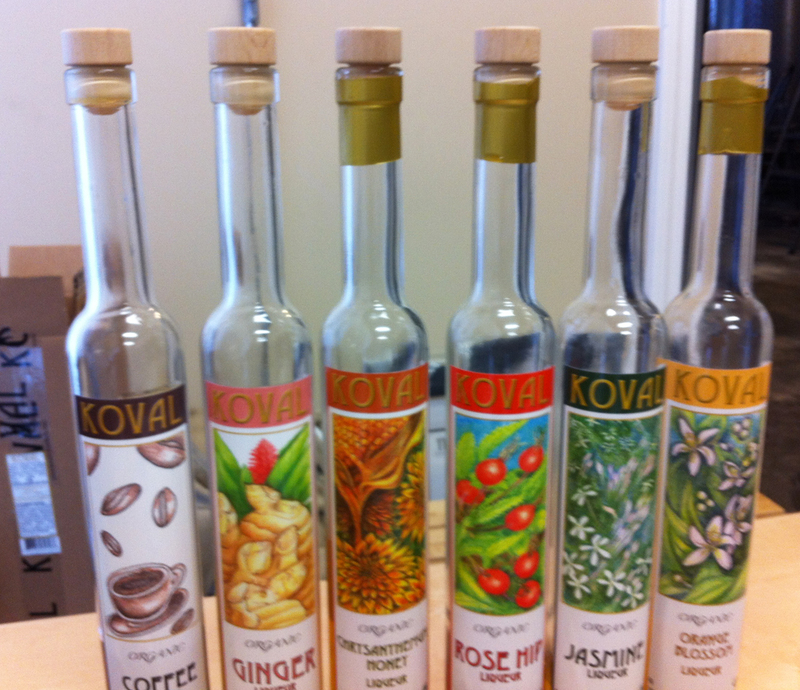 Koval Distillery is family owned by a husband and wife, Robert and Sonat Birnecker. In addition to making the products, Robert works with other distillers to teach them about the craft. Tours, tastings and sales are all available at the distillery. In the evening, we went to one of the grandest openings I have ever seen (and probably ever will). I was at the Radisson Blu Aqua when it first opened. It was quite a beautiful hotel with all the amenities and a great location. 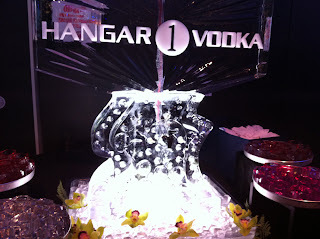 For the grand opening party, they went all out with fantastic entertainment, cocktails and unbelievable food offerings. The place had the feel of Cirque de Soleil, with performers on platforms and a band in the background. Our first stop was at the Hangar Vodka station. We were handed gloves and then sipped the spirit out of ice cups! I then switched to the tasty blueberry mojitos and watched down some of the lamb, duck and pork from the carving stations, while Lisa was in heaven with the magnificent seafood and sushi set-ups. The desserts, which included French macaroons and berries in Grand Marnier cream, were equally wonderful. It all reminded me how great the food had been when I visited the Radisson Blu Aqua and ate at their Filini restaurant. We ended the night back at the Palmer House Hilton, with a toast to another great trip to Chicago.